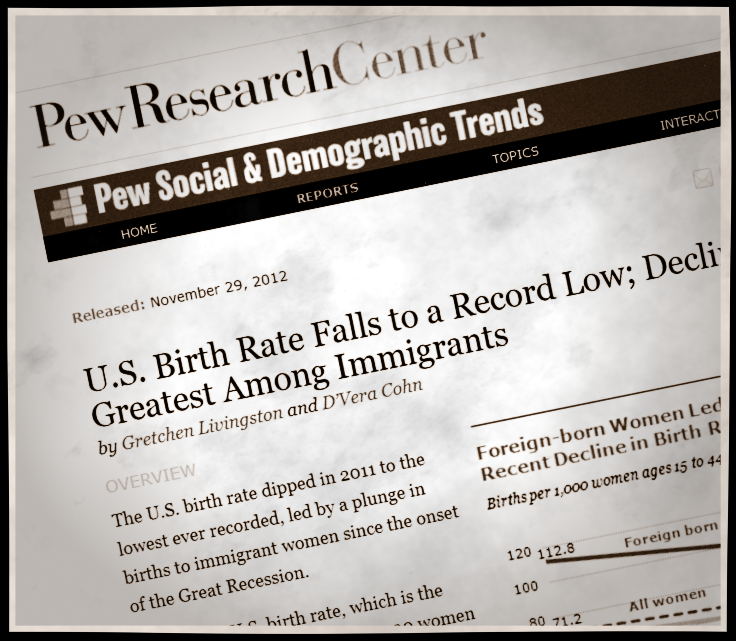 If you are worried about the over-population of America, as I am, you might have been cheered by this headline: "Report: U.S. birth rates hit record lows, largest drop among immigrant Latinas". The numbers tell the picture quite clearly. Between 1990 and 2010, for example, the birth rate among U.S.-born Hispanic women dropped from 82.4 percent to 65.4 percent. Wow! One hundred of these women used to have 82.4 babies a year, and now, 100 of them have only 65.4 babies a year? Well no, what the article, for a publication called NBC Latino, meant was that the number of babies a year per 1,000 women in that population had declined by that amount; as any fifth grader knows, that is not a percentage. With the U.S. population increasing at the rate of about 2.5 million a year (with most of that related to arriving immigrants and high birth rates of resident foreign-born mothers) and with our frayed infrastructure becoming more feeble and more crowded with every passing day, any decrease in birth rates in any U.S. population is good news. This article, as many others on the subject, focused on an immediate bit of news (the dropping birth rates) as did the underlying Pew Research Center Study without paying much attention to the unpleasant background situation. The birth rate for immigrant women is almost half again as high as it is for U.S.-born women; it is 149 percent of the rate of the latter group. That's the vital part of the news that the media is either blind to, or seeks to downplay.